Leinster secured a home quarter-final in the Heineken Cup after a bonus-point victory in Paris on Friday night. The visitors led 21-11 at the break thanks to tries from Isa Nacewa, Sean O'Brien and Jonathan Sexton with Virimi Vakatawa touching down for Racing. Sexton sealed the bonus point with a 62nd-minute try and Brian O'Driscoll completed a fine Leinster display with the fifth try. Fly-half Sexton finished with 21 points as Leinster topped Pool Two. Racing were out of contention for a place in the last eight but they made a bright start. Juan Martin Hernandez fired over a penalty before Dan Scarbrough broke from his own half before being held up close to the Leinster line. The visitors cleared and were soon into their stride with Nacewa going over from Shane Horgan's pass for a converted try on 11 minutes. Hernandez missed a penalty four minutes later but Vakatawa won the high ball from the restart and burst down the line for a try, which Hernandez failed to convert. Leinster surged clear with two tries in five minutes, starting with O'Brien darting over from an Issac Boss lay-off before Gordon D'Arcy set up Sexton to sprint to the line. Sexton converted both tries to make it 21-8 although Hernandez reduced the gap with a penalty four minutes from half-time. It was a tight affair at the start of the second half but Leinster took control after Sexton's penalty on 54 minutes. The fly-half secured the bonus point eight minutes later, going over from Nacewa's pass before adding the conversion. Sexton was adding the extras again in the 68th minute, after O'Driscoll charged over from O'Brien's lay-off. The match fizzled out in the later stages as Leinster eased up with the job already completed. Racing Metro 92: D Scarbrough, B Fall, V Vakatawa, A Masi, J Saubade; J Hernandez, N Durand [capt], J Brugnaut, G Arganese, S Zimmermann, S Dellape, F van der Merwe, R Vaquiin, B Le Roux, A Galindo. Replacements: M Loree for Hernandez (55), F Steyn for Durand (70), A Lo Cicero for Brugnaut (55), B Noirot for Arganese (50), B Sa for Zimmermann (55), L Nallet for Dellape (57), J Cronje for Vaquiin (60), A Battut for Le Roux (40). 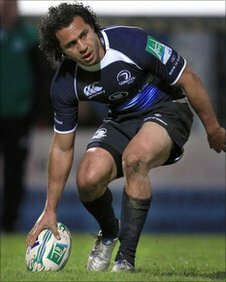 Leinster: I Nacewa; S Horgan, B O'Driscoll, G D'Arcy, L Fitzgerald; J Sexton, I Boss; C Healy, R Strauss, M Ross; L Cullen (capt), N Hines; R Ruddock, S Jennings, S O'Brien. Replacements: F McFadden for Horgan (40), E Reddan for Boss (63), H van der Merwe for Healy (40), J Harris-Wright for Strauss (45), C Newland for Ross (71), D Toner for Hines (75), D Ryan for Jennings (75).